Phantom X Lite is well balanced, powerful and fun for riders of all ages. The 300-watt free spinning motor mounted in the front wheel, enables riders to reach speeds of up to 18 mph, and delivers 500 watts at peak. The highly efficient and lightweight 36 volt 10.4 amp hour, Samsung cell battery delivers a maximum 25 miles per charge. Just give a half-twist to the throttle and away you go, experiencing the ease of “power-on-demand” propulsion. Riders love the precise engineering of the SRAM drive train consisting of an XO Twist 9-speed shifter and X7 9-speed mid derailleur along with a SRAM PG-970 9-speed cassette. The SRAM PC 971 9-speed chain outer plates are nickel plated for corrosion resistance and its PowerLink connector makes cleaning and repairs incredibly simple. The impressive Avid Hydraulic disc brake system offers great stopping control and reliability. The Avid 180-mm HSX heat-shedding rotors stay cooler which will have you riding longer without overheating. There’s also a shock-minimizing Rock Shoxsuspension fork to keep your ride smooth. Continental Traffic 26-inch tires and triple-box wide 32-mm rims will take you from city pavement to bike trails in one smooth, seamless ride. The aircraft-grade, aluminum alloy frame also folds for easy storage. 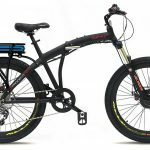 The Phantom X Lite provides a smooth, easy, and enjoyable electric ride whether you are commuting to work, school, running local errands, or just taking a cruise through town.